The only convictions of the investigation were low-level crimes which had nothing to do with Trump. New York: After 675 days, 25 million dollars, 2,800 subpoenas, over 500 witnesses, and more than 500 search warrants, all of which took up the time of 20 prosecutors and nearly 50 FBI agents, Special Counsel Robert Mueller submitted the results of his “witch hunt” to the Attorney General of the United States of America, Robert Barr. Barr, in turn, submitted a four-page overview highlighting the following conclusions: There are no further indictments of anyone and there was no collusion with Russia by any American. Barr and Assistant Attorney General Rod Rosenstein, whom Mueller reported to, determined that there was no obstruction by President Donald Trump. But, for the past three years, elite Democratic Party partisans, along with their media partners, force-fed thousands of “Bombshell” headlines to millions of Americans, without ever providing a lick of evidence. 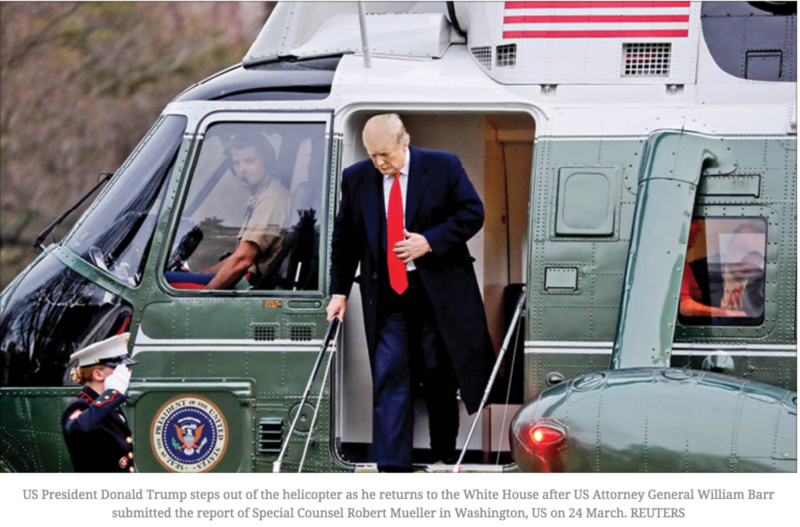 The absence of evidence supporting their outrageous lies coupled with the results of Mueller’s investigation and Barr’s conclusions establishes collusion—not between Russia and the Trump family to influence the 2016 presidential election, but amongst the Democrats and mass media to delegitimise the Trump presidency. The Speaker of the House, Nancy Pelosi said, “We saw cold, hard evidence of the Trump campaign, and indeed the Trump family, eagerly intending to collude with Russia.” Pelosi has never presented any evidence to support this claim or any of the many other suspect claims the Speaker has made. The Chairman of House Intelligence Committee, Adam Schiff said, “I have evidence of collusion with Russia and kompromat. It’s all in plain sight.” Schiff regularly repeated this claim to the public, yet never provided any evidence. He appeared on CNN, MSNBC, NBC, and ABC over 150 times and was never called out for repeating these lies over and over again. Congresswoman Maxine Waters stated, “Trump and his buddies are scumbags who are all Putin’s puppets; we will Impeach 45.” Waters has been shrieking “Impeach 45” since Election Day in 2016. Water’s reason: she hates Trump and the entire Grand Old Party “GOP”. Many other Democratic members of Washington DC’s swamp echoed similar propaganda that mobilised the Trump “resistance”. Their hit list of frequent salacious claims included “Trump in handcuffs”; “The entire Trump family, frog-marched, and jailed forever”; “Treason, much worse than Watergate, we have evidence”; “Trump has been a Russian asset since 1987”; “Trump is a racist, sexist, misogynist, Islamophobic, homophobic, transphobic, anti-Semitic, xenophobic, white-national, white-supremacist”; and let’s not forget “He’s the next Hitler”. This “hit list” has become the Democratic Party mantra since Donald Trump announced his candidacy in 2015. Ex-Central Intelligence Agency, “CIA”, director John Brennan, who just so happens to be on MSNBC’s payroll, also weighed in on Trump. “Trump’s behaviour is treasonous. He committed high crimes and misdemeanours. There is evidence that proves many people in Trump’s orbit are guilty of serious crimes and indictments are coming, and soon. Trump committed treason.” The penalty for committing “treason” in America, death. Brennan never provided any evidence. Brennan’s lies have destroyed the CIA’s reputation and credibility. Viewers of CNN, MSNBC, NBC, and ABC were inundated with purposeful misrepresentations that continuously promised faithful audiences that Mueller and his team had “mountains” of evidence of Trump’s collusion with Russia and obstruction of justice. Day after day, these media outlets repeated how Mueller would deliver an indictment of President Trump, who had committed “treason and high crimes and misdemeanours” that would lead to his impeachment and jail time. The corrupt media represented that Trump’s family members, who were also guilty of similar crimes, would be sent to prison. All the above were outrageous lies. These salacious accusations proved to be part of an elaborate scheme to delegitimise the sitting President and his administration in order to remove him from office. However, the Democrats and mass media could not have done it without FBI Director James Comey’s exploitation of the United States Foreign Intelligence Surveillance Act (FISA). We know the whole coup d’état was facilitated by FBI Director James Comey’s 20 October 2016 submission of a 66-page application to the FISA court. Comey and Sally Quillian Yates, the Deputy Attorney General of the United States, signed this application. Judge Rosemary M. Collyer, the presiding judge of the secret FISA court, granted an order that led to the intelligence agencies spying on the presidential campaign of Donald J. Trump. The FBI ran a counter-intelligence investigation named “Crossfire Hurricane” on Trump’s campaign. In a meeting with President Trump in early January 2017, James Comey told President Trump about the existence of the Steele dossier and told him not to worry about it. Comey stated that the dossier’s contents were salacious, unverified, and untrue. Apparently, James Comey knew, yet never disclosed to Judge Collyer, that the Steele dossier was garbage prepared by political partisans that did not want Trump to be elected and financed by Hillary Clinton’s campaign. Three days after Comey’s meeting with Trump the entire Steele dossier was “leaked” to numerous media sources and published in its entirety on Buzzfeed, with no mention that none of the claims in the Steele dossier had been verified. Comey signed and submitted two more FISA applications, one in January 2017, and another in April 2017, which relied upon the Steele dossier. FISA Judge Michael W. Mosman signed the January renewal, and Judge Anne C. Conway signed the April renewal. Apparently, Comey never disclosed to any of the FISA judges that the Steele dossier was: paid for by the Hillary Clinton campaign, and the DNC, or that the Department of Justice’s Bruce Ohr had warned on the credibility of the unverified Steele Dossier, or that Bruce Ohr’s wife worked for Fusion GPS and helped back door the Steele dossier into the FBI, or that the dossier was filled with baseless allegations, lies, and propaganda. It appears that four secret court, FISA, judges were lied to in order to kick off the biggest scandal in history. FBI’s Deputy Director Andrew McCabe recently stated during Congressional testimony that “without the Steele dossier, the FISA warrants would have never been granted”. Recent reports suggest that it was ex-CIA director John Brennan who insisted that the Steele dossier be included in the intelligence report used to request the FISA warrants. Senator Rand Paul has issued a call that Brennan be called to testify under oath in Congress. Why is Judge Collyer not looking into these and other material misrepresentations used in the FISA application to obtain search warrants to spy on Americans and on a presidential campaign by its opposition and enabled by a weaponised Obama Department of Justice? The silence of secret FISA court Judges Mosman, Conway, and Dearie is frightening. America’s secret courts should be abolished.